A first for Stitch Retreats – a THREE day workshop with Cas, starting at 10am on the Saturday morning and finishing on Monday at 4pm! The colours and textures in the urban and natural landscape, from light raking over a ploughed field, bright summer flowers, to buildings reflected in water can provide stimulus for the design process involved in the creation of the narrative, formal or abstract qualities in textile and mixed media work. 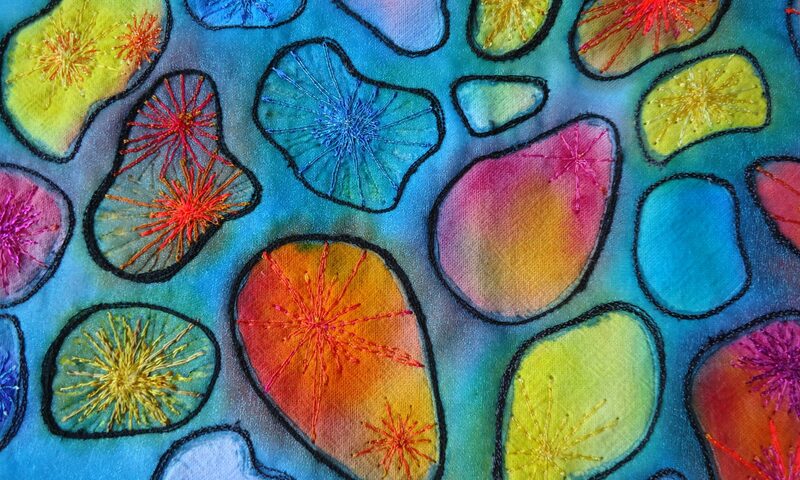 We will use a range techniques from the application of dyes and paints ,to create marks, to informal collage, appliqué involving the bonding of fabrics best described as ‘painting with cloth. This will include the application of sun printing techniques, weather allowing, as part of this explorative process. These newly created surfaces, with the addition of stitch, will evolve into individual samples and pieces reflecting the locality and places which inspire you. Cas Holmes is the author of several textile and mixed media books for Batsford publications the most recent Stitch Stories talks about the creation of personal narrative in stitch. She is currently working on her fourth book and developing new work for exhibition in Netherlands and Germany in 2018. All accommodation and food is included in the price of the Stitch Retreat – £425.